The Marine Mammal Center is a wonderful field trip destination for students of all ages! Enhance your curriculum with an interactive school tour of our hospital. Our guided tours focus on the Center's mission and work including topics such as what we feed our patients to how we diagnose diseases. All of our school programs align with the Next Generation Science Standards. The species and amount of patients we have on site change daily. Our busiest patient months are March - June and our slowest patient months are November - February. Please check the Current Patients page of our web site for the most up to date information about our patients. 15 participants (including chaperones) for the add-on Behind the Scenes tour! Read the description of the guided school tours below. Please note: Colleges interested in taking a program should visit the College Tours page. Add this exciting option only available for small groups of high school students onto your Marine Science Careers or Diagnosing Diseases tour. Students will have a unique opportunity to expand their understanding of marine mammals through a look at some of the unique case studies treated at our hospital. 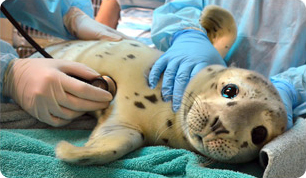 Take a peek behind-the-scenes at our harbor seal hospital, life support systems and patient treatment areas while exploring the unique injuries and illness treated here using cutting-edge research and technology. *This option is an add on to a tour and cannot be booked separately. **If your party is more than 15 people, please email learn@tmmc.org for bookings. 30 minutes • $150 • 15 participant maximum. As a result of generous support from donors, The Marine Mammal Center is able to offer a limited number of needs-based scholarships to eligible applicants. Scholarships for The Marine Mammal Center's "School Tours" and "Sea to School" programs are awarded based on Free and Reduced Lunch Plan eligibility and scholarship availability. For example, a school with 60% of its student population receiving FRLP will be eligible for a scholarship which will cover 60% of the fees for the selected program(s) if the application is approved. This school would pay just $74 for a program that is regularly priced at $185. A limited number of scholarships are available and will be provided until all funding has been distributed. For this reason, we recommend booking as early as possible. Scholarship programs are typically restricted to the months of October-January. Please email learn@tmmc.org with questions or to request a scholarship application.